Innovation Games and Marketing – a match made in Heaven! « HOW TO: Grow your Facebook Page by 17% in 1 week! As sure as you are reading this you have been in a meeting where someone whips out a spreadsheet with a list of 30 or more items on it that just seems to be “all over the place” and its clear that you are going to need to spend a lot more time than the planned 60 minutes helping them prioritize that list. What if there was a better way? Luckily there is thanks to Luke Hohmann. Luke is the founder of The Innovation Games® Company and one of the most passionate people I have ever met when it comes to applying serious games to solve business problems. I met Luke at the ITSMA Marketing Leaders event back in May of this year and I committed to Luke to train my entire leadership team in the art and science of Innovation Games. Truth be told I wasn’t 100% clear on what I was going to get out of 2 days of training for my leadership team but my word is my bond and lucky for me so was Luke’s! What happened over those 2 days was amazing – we took real world problems that Luke encountered (with the names changed to protect the guilty!) and applied Innovation Games to solve them. It was less about learning the games but more about learning to solve a problem with gaming. 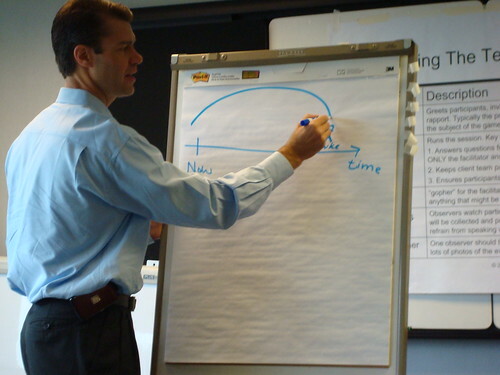 I was so impressed and inspired that my commitment to Luke was to write about how the games I learned in his workshop could apply to solve real world marketing problems – so here are 4 scenarios your should recognize from your day to day and how applying Innovation Games would make the results even better! Need to prioritize a list of marketing initiatives? – Why not play 20/20 Vision! 20/20 Vision is simple and easy to play – remember that spreadsheet from the scenario above with all those initiatives that needed to be prioritized – start by writing each initiative down on a 5×7 index card. Next, have someone from the team lead a negotiation of the relative importance of each initiative with the whole team. Place one on the wall and have the team prioritize the next one higher or lower on the wall depending on its importance to the marketing plan. BINGO you have fun, its engaging, no one can look at their iPhone and most importantly it breaks the mold of the stodgy meeting. Luke even has a version of this online that you can use if you are a distributed work force like so many of us are now a days. Want to know what customers really want from your product or service? – Why not play Buy a Feature! Buy a Feature helps you get clarity on those “bells and whistles” that engineers typically THINK are cool but no one ever uses. What if you could get customers to help you rank the ones that they would actually pay for? The good news is – you can. Luke created a game (either face to face or online) in which you can actually give play money to customers to buy a feature for your product – but the catch is they don’t have enough money to buy any one feature by themselves. Which means that they need to collaborate with others in the game (usually 5-8 players) to get the best features. In this way you get to hear (in-person) or see (in the online game chat log) what they like about each feature and how they collaborate to get a feature they want into your product. It brings the voice of the customer into the process (great) but you also get a list you can bring back to the engineers and say “our customers want to buy these features!” FANTASTIC! Want to drive leads AND know what is holding potential customers back from buying your type of product or service? – Why not play Speed Boat! Speed Boat is a metaphoric game that you could use at a trade event to ask potential buyers what is holding them back from buying your type of product. Say you sell Social Intelligence tools – why not have a gaming area in your booth where you ask everyone walking by “What’s holding you back from getting the Intelligence you need from your Social data?” – hand them a card (in the shape of an anchor hence the metaphor speed boat) and a pen and let them write down their answer and stick it on the giant speed boat on your game wall. Bingo! Fresh customer research and a potential lead now that you broke the ice with them – you can have an intelligent conversation about their answer. Its better than squishy balls and colored pens any day! Want to get ideas on how to evolve your product or service? – Why not play Product Box! Product Box is a game you play with teams or even individual customers (perhaps at a trade event or users group). You basically hand them a blank box with a bunch of creative materials: markers, magazines for images, stickers, tape, glue sticks, whatever it takes to decorate their “ideal version of your product or service”. Give them 45 min – the first 30 they typically spend thinking and cutting images out of magazines but them give them the 15 min warning and watch the creativity flow (its like the Quick Fire challenge from my favorite reality TV show Top Chef – but for your product or service). Then film them (if they will allow you) selling the box to you so you can take all these great ideas back to the lab! There are plenty more ways to leverage the games – just ask Luke. You can contact him on Twitter (@lukehohmann) or buy his book Innovation Games – Creating Breakthrough Collaboration on Amazon for more information. 2 comments to Innovation Games and Marketing – a match made in Heaven!